The ruined former home of notorious Satanist Aleister Crowley has been put up for sale. It is on the market, along with over 22 acres (9 hectares) of land, for over £500,000. Mr Crowley is said to have carried out what he claimed were black magic rituals at the property, near Foyers, between 1899 and 1913. The building - which was later owned by by musician Jimmy Page, of Led Zeppelin - is reported to be haunted or cursed. 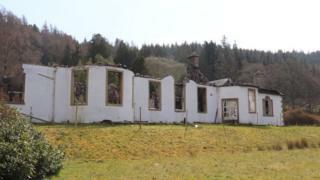 A major fire ripped through the B listed Georgian Boleskine House above Loch Ness in 2015.